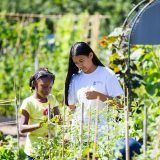 Discover more programs at NYBG intended for families including the Children’s Gardening Program, Science Camps, Nature Explorers for early learners and their caregivers. Partial scholarships are available thanks to the generosity of the Rebecca Sealy Mallory Foundation. This PDF is for parents who wish to register for The Children’s Gardening Program by mail or fax, rather than using our online system.